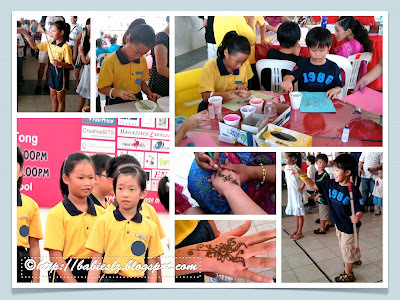 LZ's school celebrates their 70th Anniversary and organise a Charity event. Kids were asked to sell the charity vouchers and we supported it by buying 2 sets of the coupons. We used it for food, drinks and games. L's class was honored to be one of the classes to be invited to perform today. The school celebrates 70th Anniversary and is closed for the day! In fact this week, they attend school for only 3 days and next week there is another day off for the kids. It is a good time for us to go to the zoo! It is not a public holiday and most kids are in school. LZdaddy took a day off and spent time with us. How sweet! Few days ago, we were at the zoo but it drizzle for a long time and we decided not to go in. Yes, were outside the zoo for an hour, waiting in the car and hoping that the rain will stop. My Babies were very disappointed and we promised that we will be back. I don't think my kids ever take any with the Ben & Jerry cow outside the zoo. Today was a good time coz no one was there! Usually we see lots of kids waiting to take pics there. 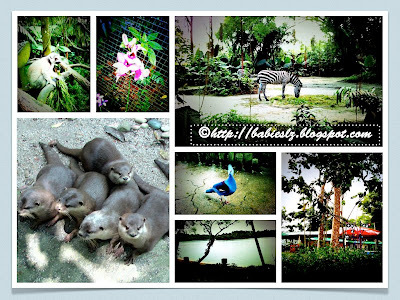 Some of the shots I took, most of it I used lomo except the otters pic. The otters were so cute! The all gathered in front of us when we walked towards them. They were very disappointed when it started to rain. Thank goodness it stopped after about 20+mins.. This was Beanie FIRST time playing at the Children playground and he had lots of fun! 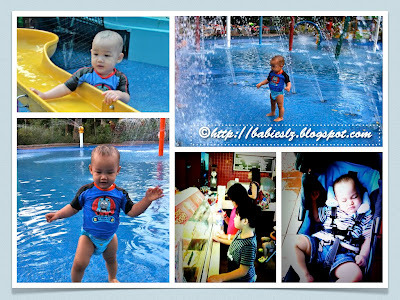 There's not much pics of L & Z coz they were too excited with the waterplay.. How often they get to play so freely without having to queue or squeeze with anyone? Right after washing up, they had ice cream and Beanie fell asleep halfway when I bf him. He was very very tired.. Though not a clear shot, I love this pic of LZ holding hands! Before I end the post, here's a pic of my Babies! L & Z's pics were taken before we leave for the zoo and Beanie's pic was taken at the zoo. They always try all sorts of way to make their baby brother laughs. Instead of him laughing, my 2 older babies giggles non stop! Finally, a decent photo of my 3 Babies! So fast! 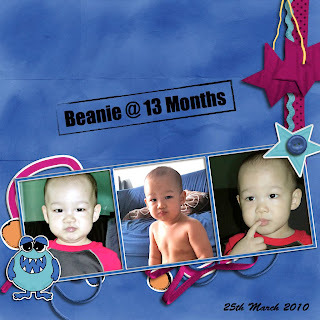 Another month has passed... Beanie is 13 months old now. My little boy has changed, in terms of his eating habits and probably due to him teething lately. He has not been eating much, sometimes only half of what he used to it. I am worried... 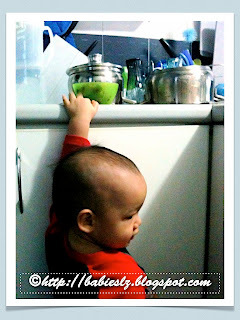 If you have been reading our blog, you will know how 'paranoid' I am with him not drinking or eating much (since newborn). Beanie having his breakfast, cheese sandwiches(wholemeal & white bread) this morning and watching TV, which is rare coz he is not keen on TV. Glad that he has appetite today! He finished the 2 sliced of bread with cheese! Enjoyed his breakfast & TV despite the noise. 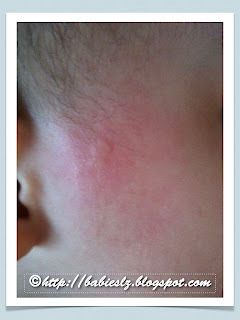 ♥ Besides not eating well, he has bad habit now. he spit out his food! He tastes something that he doesn't like, he spit it out and every time he does that, he gives me an innocent look. ♥ He enjoys feeding himself with his hands and he tries to use to spoon but still can't do it. So whenever we have our meal, we will prepare some diced carrots/pumpkin/potato, peas so he can keeps himself busy. And he loves to feed me too! ♥ Beanie loves vegetables! If we put meat & vegetables in front of him, he will definitely go for the veg! ♥ This little boy of mine has kept us busy! He takes out all his clothes from his drawers! He knows which drawer belongs to him. Besides that, we have to be careful with what we place on the tables (study table, dressing table etc) he will reach up and sweep everything onto the floor! And gave me this look when I said no and he has to wait. 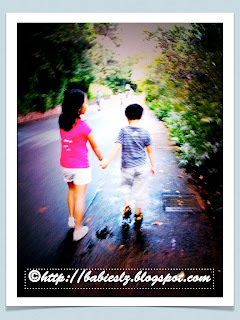 ♥ He enjoys going out, even though it is just a trip to the school to pick LZ up. When I tell him I am going to help him wear his shoes, he happily sit down on the floor and tries to put it on himself. But of coz he can't at this age. ♥ When I ask him where is his tummy, he smiles and tap on his tummy. So cute! ♥ He loves it when we say "Ahhhhhh...." and stop together... Sounds boring right? But we enjoy doing it. 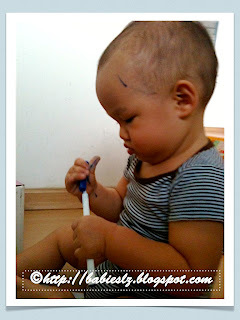 ♥ When he sees a pen/marker, he grabs it and starts doodling everywhere and I have to quickly get him a paper or bring him to the easel. Lately he practices his motor skills with it. He removes the cover and cap it and he do this many times. Here's a video of him doing it but be warned! He screamed towards the end of the video clip! 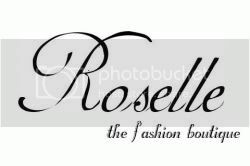 ♥ Like I said in the previous monthly update, Beanie gonna be my little assistant. He now helps to put back the house phone. He loves to play with the phone! He pretends that he is talking on the phone. Haha... Whenever I caught him playing with it, I ask him to put it back and he will do it. 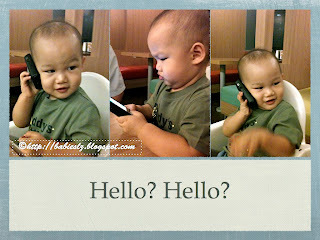 ♥ Besides the house phone, he is an iphone user! Haha... He knows how to tap on the screen to 'turn' the page for the flashcards (which I downloaded for him) and he likes the song 3 little monkeys (which I downloaded for him too). In the boxes: Grapes, strawberries, bunny shaped (without face features) nutella sandwiches and cereal. This was recorded yesterday when L went for her exam. Little Beanie was very busy! Hehe... He walked around with his lunch bag after his meal. This is what he likes to do nowadays, carry his own lunch bag or his sibling's (he carries the bag for me when we go to their school). 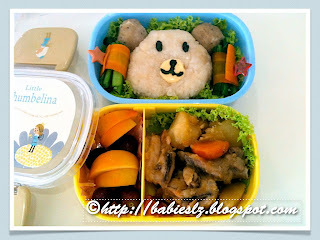 Top tier: Bear shaped rice, mushroom balls, caixin wrapped with carrots. Bottom tier: persimmon, grapes and chicken stew. I like what I did with the bear today, using mushroom balls for the ears. I know I did quite a few bear shaped rice for L, so this time I tried to do something different. For the rice, I used a little light soya sauce to make it look brownish. Pics taken while she was waiting to go into the room. L missed school today coz she has ballet exam. She wanted to go to school for few hours so she will not missed out anything but I told it is better for her to rest at home and be prepared for the exam. 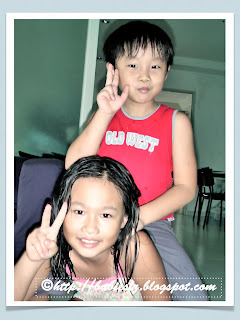 I think most kids look forward to school holiday, so they do not need to go to school but not my girl. She loves school and seeing her friends. My princess was very nervous... It was written all over her face. I got to keep talking to her or ask her to do something so as to distract her from thinking about it. In the morning, she practiced and practiced the steps at home. I told her to relax and treat it like one of her lessons. It is easier said than done. She asked me what if she fails... I told her what most important is that she knows she has done her best and even if she fails, she can take the exams again. I have confident in my girl. I'm not sure if she will pass with flying colors but I know she will pass. 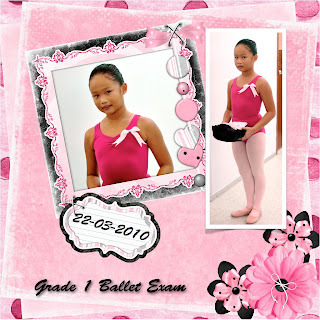 When we were at the dance school, she practiced again with her teacher and classmates. Other girls were not as nervous as her, maybe due to age, she is a yr older than the rest (she started ballet a year late). I didn't want her to be distracted by me or Beanie so I stand quietly a distance away to record (video) her. Such a pity I won't be able to see how she performed in the room. When she came out from the room, I could she was relieved! Her smile was more natural! Haha... After that, we rushed to school to pick Z up. Sweetie, I know you can do it! 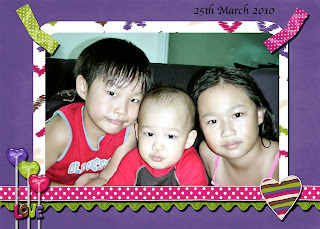 Today is the FIRST time Z goes to school without Jieje. L has to go fro ballet exam later so she is excused from school. Think he felt kind of boring, having breakfast and getting ready on his own. I have started preparing 2 sets of bento for them to bring to school every Monday. 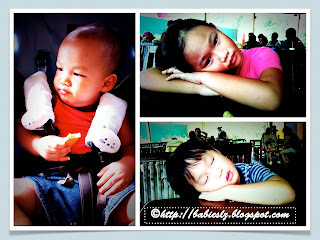 I can't bear to see Beanie not getting enough rest whenever I have to make an extra trip to school when he is supposed to be napping and it is HOT to send the food during 2nd recess. That means on Mondays, I have to prepare 4 SETS, 2 snack & 2 lunch bento. Sometimes, if I can't get get ready the bentos ready in time, I will give them to snack bento and send the lunch bento (for their 1st recess, also their early lunch) to school. This way, Beanie will be back home in time for his nap. Top tier: Cookies (LZ baked it on weekend), raspberries. Bottom tier: Meatball & fishball, corn, sausages and purple wheat noodle with spinach. 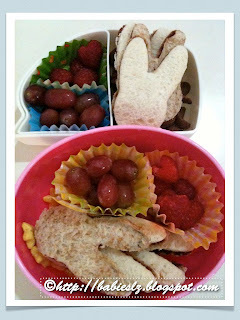 In the box: Nutella sandwich, longan, grapes and a Easter chocolate. 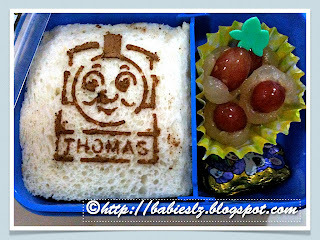 I used hot chocolate powder for Thomas as I ran out of milo and it taste just as good. 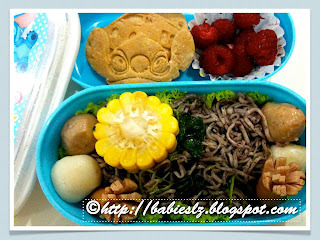 For the 2nd recess bento, I usually have to prepare something that can 'survive' hours before they eat it. So far, food that are used for 2nd recess 'survived' till they eat it. Also, I prepare something light. With 2 bentos, sometimes it may be confusing for Z which one he should eat first. So from today onwards, I will be writing a small note for each of his bento. He loves the idea! This is the second time Beanie tried durian and he still doesn't like it. My boy looked so cute when I tried to feed him. 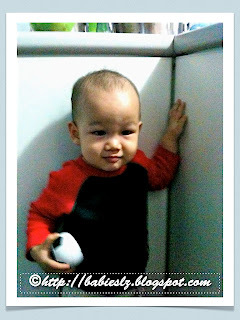 *proud mommy* And my老二 was so cheeky! He tried the durian again and I am thinking if I should post it up. I know he is not going to like it if he finds out. His expression is just as 'bad' as his brother! My princess refused to taste it. 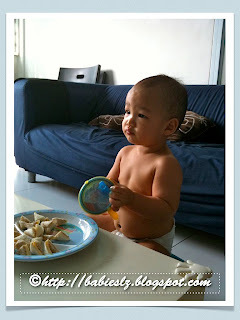 We have tried feeding our 2 older babies durian since young and they rejected it since then. Just some random pics taken when we were out today. 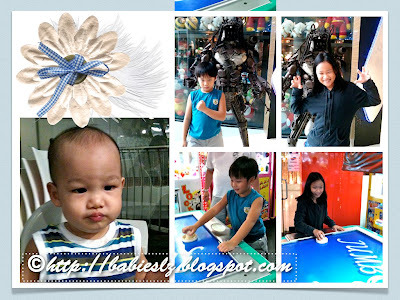 We were supposed to go to the zoo but it was raining heavily.. Knowing that our babies were disappointed, we brought them to the arcade instead. Bento #163 (2 sets) -Cars?